Noémie Schmidt as Anna in the promo for Élisabeth Vogler’s Paris Est une Fête. 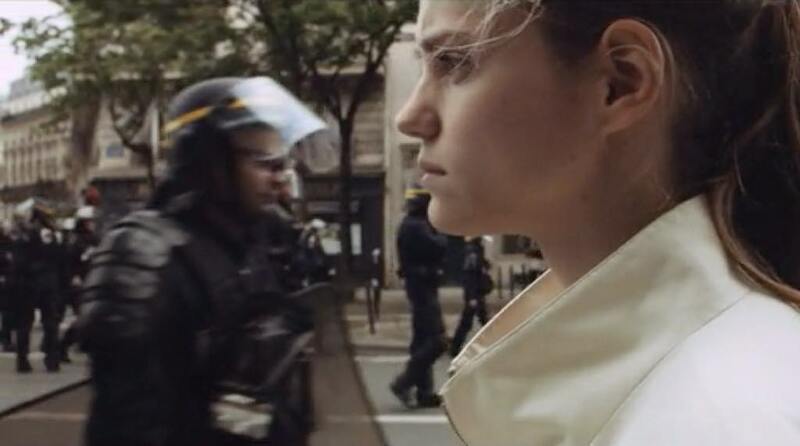 As events swirled around them, they wanted to jump right in and start making the movie, using the backdrop of real events – the Fête de la Musique, demonstrations, Nuit Debout, sit-ins and even President Emmanuel Macron’s speech at Johnny Hallyday’s funeral – to tell their fictional story, without going through the lengthy process of finding financing and writing and rewriting the script to please investors. A dozen actors and technicians, most of them under-30s, volunteered their time and money. No one paid much attention to their project until – after three-and-a-half years of filming – they put Paris Est une Fête on Kickstarter in January to raise money for postproduction. Since then, the video presenting the project has been viewed over 2 million times, and they have raised €50,000 of the €85,000 they are seeking. Directed by Élisabeth Vogler and produced by 28-year-old Laurent Rochette, the movie stars Noémie Schmidt, who played a role in the hit TV series “Versailles,” actor Grégoire Isvarine, newcomer Marie Mottet and one old-timer, 74-year-old Lou Castel, a seasoned actor with over 80 films under his belt. The story focuses on Schmidt’s character, Anna, who narrowly escapes death when she misses a flight that crashes, and follows her as this confrontation with her own mortality affects her mental state while she lives through the turmoil of life in Paris in the past few years. “Paris becomes the mirror of her distress,” says Rochette. Major film producers are now taking an interest in Paris Est une Fête, and it looks like there is a good chance of it being distributed. Whether or not it will be a good film remains to be seen, but we can only applaud the initiative and organizational skills of these young people.